Week 1 Weight Loss: I’m just beginning. Tune in next week for that! On Friday I received a package on my doorstep. It was my pedometer and scale (I’ll get my strapless heart rate monitor later). I was able to set up both products for use very easily and I even synced my pedometer to OmronFitness.com (and linked my twitter and runkeeper accounts). Having the dashboard online will help me with goal-setting as well as show me the progress I’ve made in reaching short and long-term successes. Last week I took a last-minute cross-country road trip, but twice during that trip I was able to go running (in Augusta, Georgia, and in Lincoln, Nebraska). I also went running on Saturday here in the frigid cold mountain air. So while I’ve been diligent, even on the road, with my cardio (half-marathon training, you know), I know I’ll feel the effects from kicking things into high gear with resistance training this week. If you see me walking funny, or involuntarily groaning, or falling out of the car when I open the door, or falling anywhere for that matter, please – be gentle. Also, I’ll be living in my workout clothes, I’m pretty sure. Wish me luck! And follow my updates on facebook, twitter, instagram and pinterest! 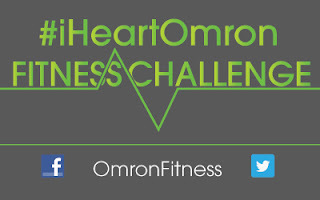 This post is sponsored by Omron Fitness as a collaboration with Bookieboo Blogging Networkand Mamavation – a community dedicated to weight loss for women and obesity prevention for families. I was provided with product and compensation for my time and honest opinions. *We’re just really sweaty. All of us. Suuuuuuper sweaty. Great job keeping up with your workouts while on the road, that is not easy! Good luck achieving your goals with this challenge! Wow, awesome job keeping up with the cardio while you were traveling! That's amazing! I hope you have an awesome week!